Lindsey and Grayson have two awesome kids, Tilley-Gray and Maines. 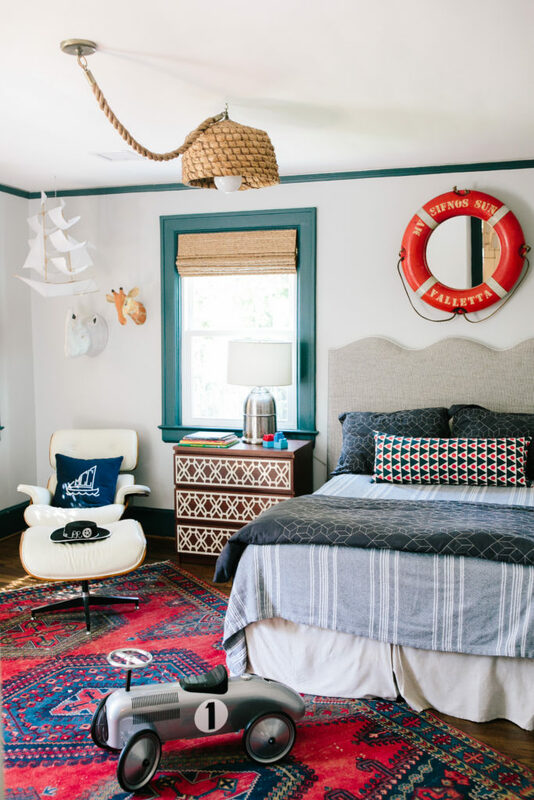 When it came time to design their rooms, Lindsey created super stylish, fun spaces for both of them. Each bedroom suits her kids’ personalities and the shared bathroom is not only playful but also super functional. Read on to get Lindsey’s take on designing these spaces. Gathered: Your daughter Tilley-Gray and son Maines both have adorable bedrooms. 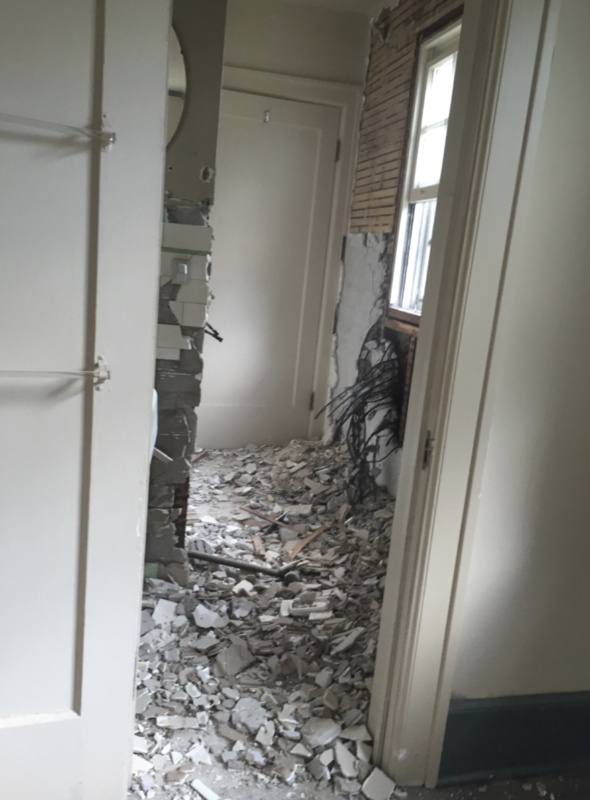 Did they get much say in the design of their rooms? Lindsey Cheek: They are both still pretty young, so not really. 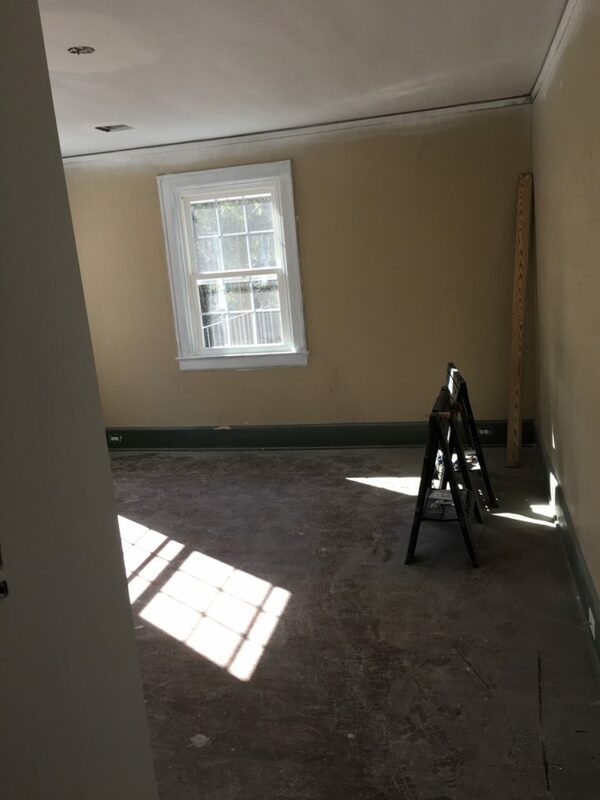 I did give Tilley-Gray some options when it came to choosing lighting, so that she felt included in the process and would be excited about her space. We also ended up adding this art table at her request because Tilley-Gray loves doing crafts and projects. Maines, on the other hand, did not get any say. He requested fire truck bunk beds and I quickly vetoed that – ha! Gathered: The shared bathroom is functional and so fun. How did you approach designing this bathroom that would be appropriate for both your daughter and son? 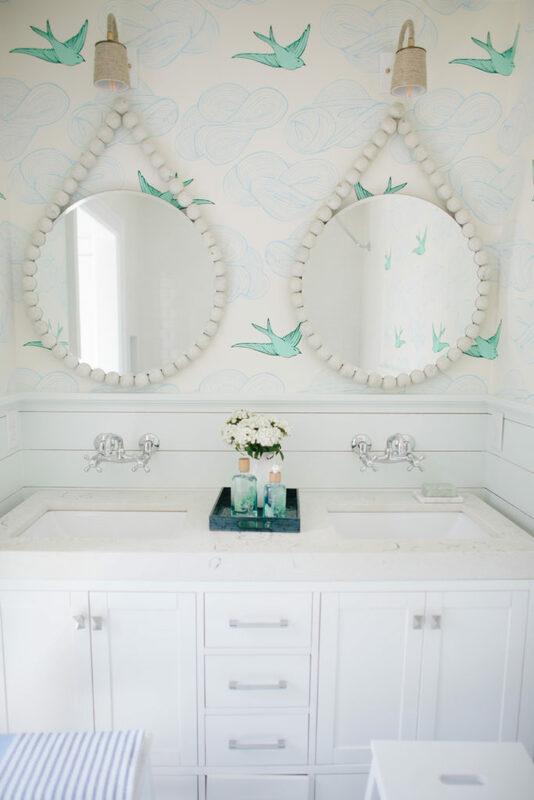 LC: My starting point for this bathroom was the whimsical wallpaper with this blue and green color palette, suitable for both boys and girls. The round beaded mirrors are a bit more feminine and the shiplap and blue and white striped penny tile is a little more masculine. I tried to find a balance that would satisfy both of them, while also being kid-friendly. The concrete countertops are virtually indestructible (filled in with shells my kids have collected!) and the ship lap protects grimy little hands from the wallpaper. The double vanity will also come in handy as they get older. We had to widen this bathroom in order for it to work for both kids, which means we lost square footage in each of their bedrooms. Totally worth it in the long run though! Gathered: Even though Tilley-Gray and Maines are young, their bedrooms seem like they’ll remain relevant as your children get older. What are some tips for designing kids’ bedrooms that won’t look too “baby-ish” several years down the road? LC:For Tilley-Gray’s bedroom, I chose a modern, bright floral fabric that is appropriate for a little girl but can also grow with her. The fun light fixture will definitely last her through her teenage years until we switch it out for something a little more sophisticated. Her art desk will serve as a great spot for projects until it is time for homework, then we’ll get a real desk in here. Maines’ room has lots of “grown-up” elements like this vintage Eames chair and the Turkish rug, but I mixed these in with little boy appropriate accessories like the lucite bookshelves and faux animal heads. Gathered: There are some super unique accents in both of these rooms that make them different and special, like Tilley-Gray’s light fixture and that beautiful vintage rug in Maines’ room. What are some of your favorite design elements to use in kids’ rooms? LC: The rug was the first thing I picked out for Maines’ room and I created his room around this rug. Because most kids will be spending time playing on the floor of their bedrooms, rugs can make a bold statement but also be an important to the comfort factor of the space. Tilley-Gray’s pink and white striped rug is indoor/outdoor, for obvious reasons when it comes to children’s room. I love to bring in repurposed items to create a one-of-a-kind feel, like the French fishing basket that we turned into a light fixture in Maines’ room. Remember you can use things you already have but in a new way. For example, Tilley-Gray’s headboard was our old headboard, just recovered in that fun floral fabric. Gathered: What are some items that you suggest splurging on for children’s rooms? And what do you think you can save on? LC: Invest in beautiful lighting, unique rugs and fabric to use on upholstery projects. Save on bedding (Maines’ is from Target!) and accessories that they’ll quickly outgrow. 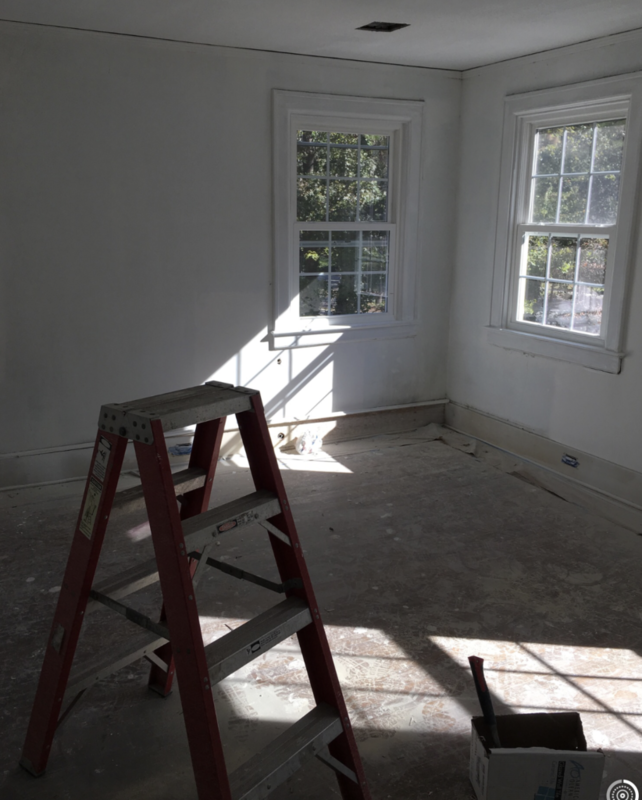 Another cost saving tip are cornices, like in Tilley-Gray’s room. Window cornices allow you to use beautiful fabric and make a bold statement but without the cost (and potential for damage!) of drapery panels.